Having one of the following plumbing problems? You should contact a professional right away! It is time to do some home improvements. 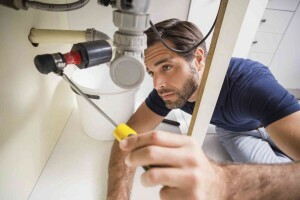 You may consider yourself a handyman or handywoman around the house, but if you are not a licensed plumber you may just be out of your league in some areas. Please do yourself a favor and call in a professional to address all your plumbing needs. Is there anything more annoying than a dripping faucet? Not only is it a pain to listen to, but it can make your water bill skyrocket. Believe it or not, you could actually be wasting hundreds of gallons of water every year. Every time you turn on the faucet, water and silicone-based washers form a watertight seal that stops water from bursting out of your pipes. These washers can become damaged, which usually results in a drip. If you are experiencing a dripping faucet you are usually better off bringing in a professional with specialized tools for the job. Have you ever stepped into the shower and had trouble rinsing the shampoo out of your hair? In addition to the bad hair day you will be having, you are probably also experiencing low water pressure. The problem may be caused by the pipes or the municipal water supply. If you are unsure of where exactly the problem lies, you should bring in a licensed plumber who can diagnose and fix it. In addition to the dripping faucet, a running toilet can make you lose your mind. After several minutes of jiggling the handle, you probably should call a professional. There may be a complex issue at play. Unfortunately, you may actually be experiencing a silent leak. Your plunger, tweezers and commercial drain cleaners can only do so much. If your problem goes beyond those common household items you need to bring in a professional. It is in your best interest to fix the problem before the clog worsens. Replacing pipes can be a messy job. They are not necessarily the hardest fix, but if you do not know what you are doing you could end up having a huge clean up on your hands. It is better to take care of leaky pipes as soon as possible before that small puddle turns into a small pond. This entry was posted on Friday, May 26th, 2017 at 5:14 pm. Both comments and pings are currently closed.